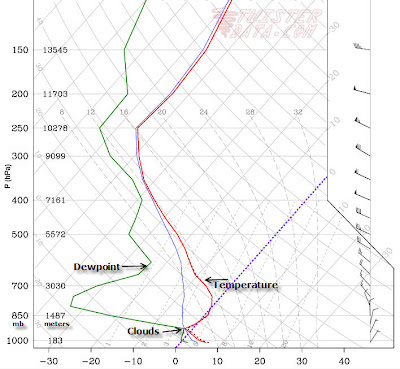 3/6/11, 3pm, Memphis model sounding. 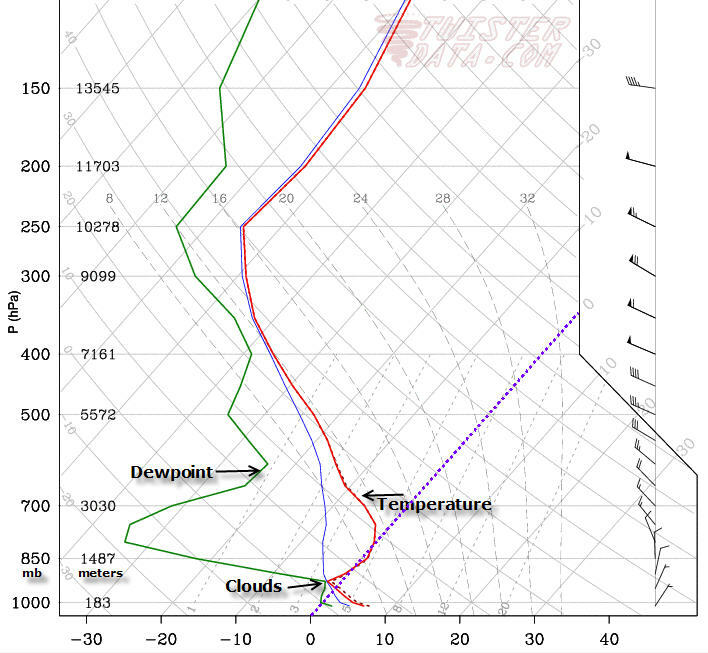 Red line is temp, green line is dewpoint (moisture), dashed purple line is freezing. Ground level is at the bottom, height rises going up to the top of the image. Where they are close together, humidity is high and clouds are expected. Temperatures increase with height at around 850mb (red line moving right as it increases in height), with the cloud layer below, trapping the clouds under sinking air. I expect to see these clouds erode this evening just as high clouds stream in from the west, thus a variably cloudy sky. With light wind and cool temperatures heading into the night, it won't be hard to get near the freezing mark by morning, especially outside of the city. For Monday, high pressure maintains control and we should see partly sunny skies (high clouds will filter the sun somewhat) and temperatures rebounding into the mid 50s. As clouds thicken Monday night and the wind remains steady from the southeast, temps won't drop as far - only into the mid 40s. The next rainmaker will move into the Southern Plains Tuesday, then eject to the northeast Tuesday night. Low pressure will be in eastern OK on Tuesday evening then quickly reach southern WI by Wednesday night. Meanwhile, Gulf moisture and some instability, along with lift provided by an approaching front, will bring widespread showers and some thunderstorms. Scattered showers should break out Tuesday afternoon with most of the inclement weather Tuesday night and early Wednesday. The front will pass through the Mid-South Wednesday morning. 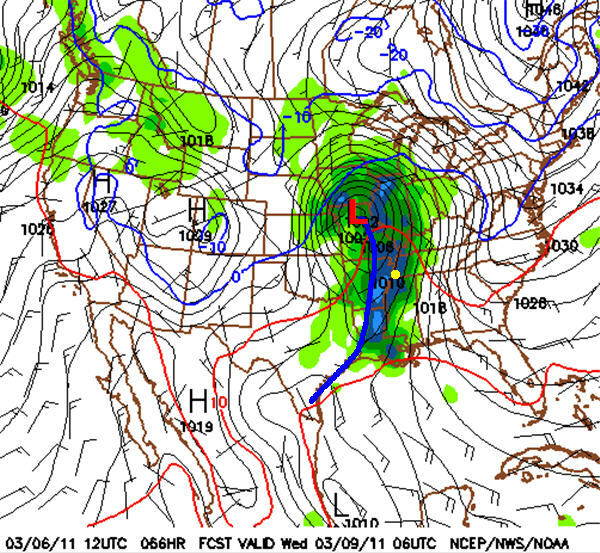 GFS forecast model for Tuesday night (Wednesday morning) at midnight. Green/blue shading is rain/storms. Thick blue line is cold front (MO-AR-LA), and Memphis is indicated by the yellow dot. While severe weather cannot be ruled out with this system, it does not appear likely at this time. However, some strong storms are possible ahead of the front early Wednesday. 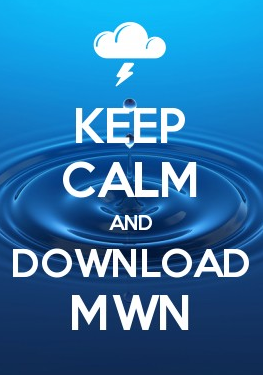 We'll continue to monitor the situation and bring you the latest on MWN and the MWN Blog and social media sites.